Opera Australia presents DON CARLOS. An Opera in four acts by Giuseppe Verdi, Libretto by Joseph Mery and Camille du Locle, based on the dramatic poem Don Carlos, Infant von Spaniel by Johann Christoph Friedrich von Schiller (1787) and on the play Phillipe II, roi d'Espagne by Eugene Cormon (1846). Libretto of the four-act version revised by Camille de Locle. Performed in the Joan Sutherland Theatre of the Sydney Opera House, July-August, 2015. Giuseppe Verdi's DON CARLOS. It is a Grand Opera. It is not often performed. I first saw it, searching for new experiences, on screen at an Opera Broadcast, starring Roberto Alagna and Angela Gheorghiu (I think) and liked it a lot. I happen to love the Schiller play, in the adaptation by Mike Poulton (2005), as well. So, encouraged by good notices and interviews (specifically with Director, Elijah Moshinsky), for the Opera Australia production in the Joan Sutherland Theatre, at the Sydney Opera House, I spend $175.00 (for not even the best seats! ), $20.00 on a program, and a $5.00 'tax'/surcharge/whatever, demanded by the Sydney Opera House Trust to buy a ticket - "Don't want to." "No ticket!" Total = $200.00. Before the performance, in the program, I read, in Director, Moshinsky's notes: "Many critics regard DON CARLOS to be Verdi's masterpiece. ..." Or, in the accompanying article by Phillip Sametz: Powerful, Lofty And Epic - Verdi's Don Carlos: "To put the case simply: DON CARLOS is one of Verdi's greatest operas. ..." One was expectant of much. 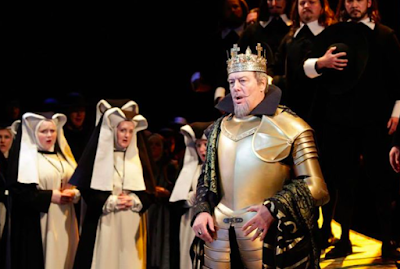 So, if Verdi's DON CARLOS is a masterpiece, it was not discernible in the stagnant, moribund showing on the Joan Sutherland Theatre stage, the other evening. Picturesque it was, no doubt. The Design by Paul Brown, huge in its theatrical gestures at magnificence, but the physical action clumsily staged, particularly, in the first half, especially, with the the auto-da-fe episode - absolutely ridiculous - in its attempted visual dramatics. In the program we are told that this production is Opera Australia's biggest since the Ring Cycle. BIG it is, and handsome, but on the tiny stage in Sydney it looked, stupid, dinky, and worse, it was boring in its clumsy action. Or, is it that the production first seen in 1999, now 16 years old, and the aesthetic qualities of the original visual concepts are now too, too over-blown for contemporary taste - technology has move on considerably in those 16 years - and/or the stage space is just proportionally to small for it to work? At the interval, the idea that this work represented a masterpiece by Verdi had me asking and discussing with a friend: "Then, is Verdi, 'dead' artistically for contemporary audiences? What we just endured was terrible." One knows, from having lived a relatively long time, that artistic works, can go in and out of fashion, and may be, I contemplate, Verdi is on the outer edges of the unfashionable 'cosmic' belt. Although, I know I can always enjoy, his LA TRAVIATA (1852), and even the silliness of the plot devices in RIGOLETTO (1851) can be overcome because of the music. And AIDA (1871), recently heard in the magnificent Gale Edwards' Handa Opera production, what ever the commercial uglinesses of the sound devices to deliver it, certainly revealed music and plot of some possible genius. A contemporary integration of craft and artistic vision on an almost 150 year old work of Verdi by Ms Edwards in almost impossible circumstances, a hit, a palpable hit (as it was with her oft repeated LA BOHEME, and her SALOME for Opera Australia.) So, what of this stricken production of DON CARLOS? DON CARLOS has had a recent showing at the Metropolitan Opera in New York, Directed by Nicholas Hytner, and a review by Anthony Tommasini (March 31, 2015), begins, "A solid cast with no weak links and a probing conductor. That's what it takes, even more than superlative individual performances, for the profundity of Verdi's DON CARLOS to come through. ..." I know not enough about the influence of the conductor on performance, in this case, Andrea Licata, to comment here, but I would add the profundity of the work also requires some major contribution from the Director. For, in the production in Sydney, the singers produced, generally, outstanding ensemble and individual performances, and the staging of the second-half scenes of the opera which demand a more intimate and uncluttered hand, were so much more arresting than the first half - we could actually hear the 'musics' without visual distractions of grandiosity of set solutions, and woeful crowd control. Ferruccio Furlanetto gave an achingly beautiful rendition of the searching self-examination that Philip II, has in the scene in the Escorial Palace. Joined by Daniel Sumegi, as the Grand Inquisitor, in duet, a thrilling and engaging musical feast was had. This followed by superb singing from Latonia Moore, as Elizabeth de Valois - outstanding artistry present, in all ways, as she demonstrated with her thrilling performance in AIDA - and a glowering, glowing musical contribution from Milijana Nikolic, as the repentant, Princess Eboli. In the following prison scene, Diego Torre, as Don Carlos, and especially, Jose Carbo, as Rodrigo, too, gave great singing. This opera is just so stupidly plotted, for a contemporary audience, that a superb production, as well as musical performances, is truly necessary to have the audience make a commitment to suspended disbelief and to go with it. Love, STARK love, in the extreme expressed permutations of Obsessive, Passionate, Unrequited and Jealous, dominated in conscience by a tyrannical religious government - represented in the body of the Grand Inquisitor - and the perfectly ridiculous solution of a ghostly figure arriving to give a resolution to all the dilemmas of the plot - is so poorly solved by the Director, in this production, that it caused a risible response from all of us. The dramatic mechanisms of this 1787/1884 story require a better production than this 16 year old one can for Sydney audiences in August, 2015. Committing my time to the Italian four act version, and my money to do it, was a risk, and I did take it on, on my own volition, so can take responsibility for my part in the performance, as an audience member (no real regrets), but I do want to protest about Opera Australia's role in all this. Yikes! Just where is the contemporary integrity of a Director like Gale Edwards to save us from this laborious production, when you need her? Bye, bye 4 hours of my life. Bye, bye, bye, $200.00 of my hard earned money. C'est la vie. Moshinsky was out for the Melbourne revival in May-June; all the principals save Elisabeth and Philip were in that. I saw this more than once. The first time I saw it my reaction was not dissimilar to yours - I couldn't quite see what the fuss about the work was, and some of the plot points were inexplicable. What exactly were the crowd doing breaking into the prison/abbey/whatever in the second-last act? (Despite that mystery I agree that the second half worked better than the first.) The musical language was also a bit unfamiliar. Going again solved the issue of the musical unfamiliarity. One retrospective key, I've decided, is that the orchestra is the same as that used in the Requiem Something to do with all that dark Catholicism? (It cannot simply be because the Requiem uses a bit recycled from and cut out of the version of Don C that we saw). I think you are a bit harsh on Moshinsky (or even Press). In any event, a fully new production would have been out of the question on financial grounds. Agree with you about the underpaying of the LOVE! aspect. Have a theory, mainly musical, about why that was but this at some point should stop as this is after all your blog not mine.